Congratulations to Petra H., winner of the tour prize and to Laurie's Thoughts and Reviews, the host winner. 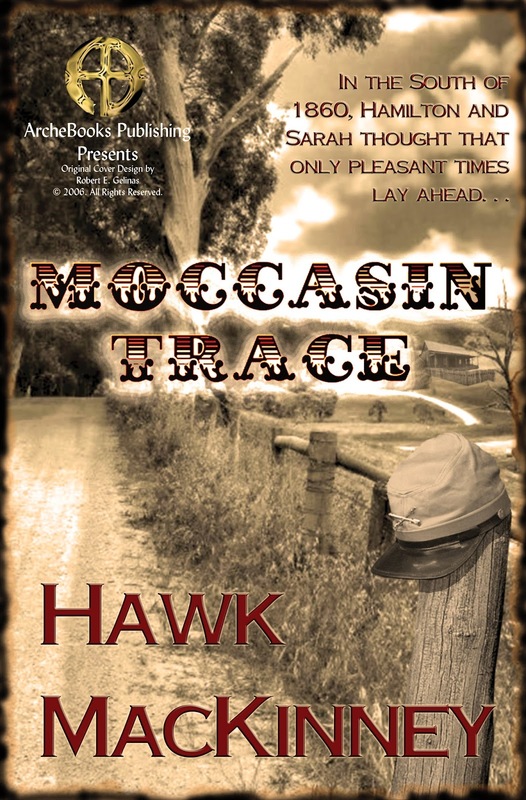 Goddess Fish Promotions is organizing a Virtual Book Blast Tour for MOCCASIN TRACE by Hawk MacKinney, a Historical Romance available now from ArcheBooks Publishing. The Book Blast Tour will take place on Tuesday, April 28. This tour will not include interviews or guest blogs; however, a blurb, excerpt and author bio will be provided to every host for inclusion on their blog. No reviews are being requested for this tour. Hawk MacKinney will be awarding a $25 Amazon/BN GC to a randomly drawn winner via rafflecopter during the tour, and a $15 Amazon/BN GC to a randomly drawn host. It is July of 1859, a month of sweltering dog days and feverish emotional bombast. Life is good for widower Rundell Ingram and his Hazel-eyed, roan-haired son, Hamilton. Between the two of them, they take care of Moccasin Hollows, their rustic dogtrot ancestral home, a sprawling non-slave plantation in the rolling farming country outside Queensborough Towne in east Georgia. Adjoining Ingram lands is Wisteria Bend, the vast slave-holding plantation of Andrew and Corinthia Greer, their daughter Sarah, and son Benjamin. Both families share generations of long-accepted traditions, and childhood playmates are no longer children. The rangy, even-tempered Norman-Scottish young Hamilton is smitten with Sarah, who has become an enticing capricious beauty—the young lovers more in love with each passing day, and only pleasant times ahead of them. But a blood tide of war is sweeping across the South, a tide that might be impossible to stand before. 11: 3 Partners in Shopping, Nana, Mommy, & Sissy Too!